Anne Needs New Lungs, Our Help and Support! My wife, Anne Ashton is a young 63-year-old woman whose life changed drastically 3 ½ years ago. At that time, Anne was diagnosed with interstitial lung disease caused by auto-immune deficiencies and was forced to stop working. Now, she is on oxygen 24/7. Anne’s doctors have told us a lung transplant is her only hope for survival. Anne and I consider ourselves newlyweds since marrying in 2006. She helps her son who is raising her 4 ½-year-old grandson on his own. 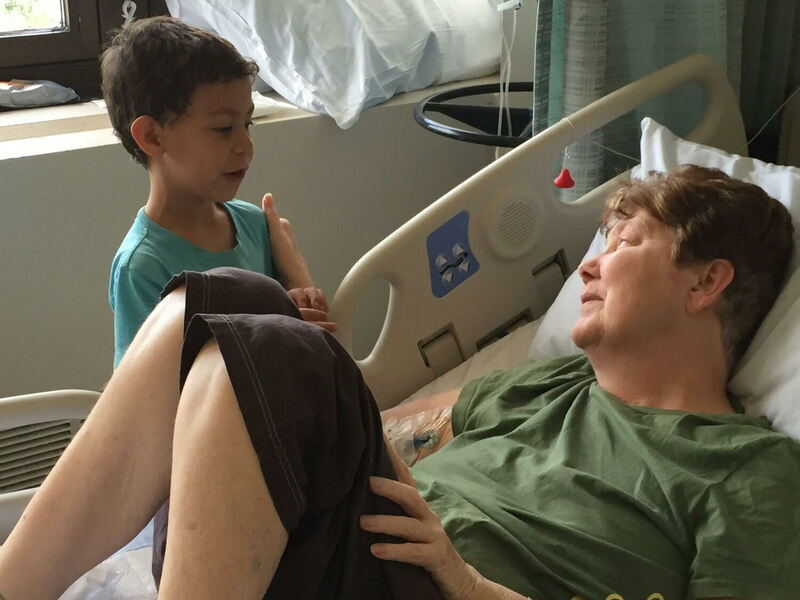 She desperately wants to return to good health so she can watch her grandson grow. He’s the apple of her eye. She plans on sharing her transplant journey with others in hopes of offering inspiration, hope and moral support. Fortunately, Anne is currently on the transplant waiting list in two regions, both Baltimore and Virginia. Transplants are life-saving but expensive. Even with Medicare, Anne is facing gaps in prescription drug coverage which will include post-transplant anti-rejection medication she will need to take for the rest of her life. Temporary housing for her and her caregiver at the time of transplant and travel expenses to and from the center must also be paid out-of-pocket. To help the financial burden of Anne’s uninsured expenses, a fundraising campaign in her honor has been established with HelpHOPELive, a trusted nonprofit organization that has been providing community -based fundraising guidance to patients and their families for more than 30 years. All donations are tax deductible, are held by HelpHOPELive in the Mid-Atlantic Lung Transplant Fund, and are administered by HelpHOPELive for transplant related expenses only. Please, consider a contribution. Anne desperately wants to be here for all of us and we need her. Know that your contribution counts. On behalf of Anne and her family, we thank you for your consideration, generosity, prayers and support. In the spring of 2012, Anne became ill with what her doctor thought was pneumonia. However, Anne continued to have respiratory issues, and her doctor recommended that she see a pulmonary specialist. After seeing doctors in her local area, Anne decided to go to Johns Hopkins, where she was diagnosed with interstitial lung disease (ILD). She tried several types and rounds of treatment to stop the progression of the illness, to no avail, and she was placed on the lung transplant list at Hopkins in April of 2015. At her doctors’ recommendation, she was also evaluated and placed on the transplant list at Inova Fairfax Hospital, where she had her lifesaving surgery on May 29 of this year. After her surgery, Anne had several setbacks, and she was in intensive care at Inova until June 25. She was then moved to a “regular” room, and then to the Inova Mt. Vernon hospital, where she began to receive intensive physical rehabilitation. On August 3, she was discharged from the rehabilitation hospital, at which point she moved to a hotel that is ten minutes away from the hospital, where she will remain until her transplant team feels that it is safe for her to return home. After that, she will have to make two trips to Inova Fairfax per week for the foreseeable future and she will continue her rehabilitation at a local facility. Anne will have to take anti-rejection drugs for the rest of her life. Her out-of-pocket cost for these medications will be approximately $10,000 per year. Today, Anne still uses a wheelchair, as well as a walker for ambulation. She continues to work very hard, and she recently took 45 steps while only holding her husband, Allen’s, hand. This is a milestone for her and we are so proud of the progress that she has made so far! She still has a long way to go, however. Please consider donating to help Anne with her tremendous out-of-pocket expenses as she continues to do the hard work of recovery and strength-building! Great news! After 60+ days in the hospital, most of which was spent in intensive care, Anne has been discharged! She and Allen have to be near the hospital, so they will be staying in temporary housing at a hotel for the next several months while Anne continues to get physical therapy and ongoing monitoring by her transplant team. Her protracted hospital stay, in addition to the added expense of having to reside in a hotel near the hospital, mean that she and her family will incur a great deal of extra out-of-pocket expenses. This is where you come in: Please consider donating to Anne’s HelpHopeLive fund to offset these costly out-of-pocket expenses! Check back regularly for updates on Anne’s progress in the coming days, as well as other opportunities to assist! Thanks in advance for your generosity and support! A Good News Update — We are pleased to share our news that Anne received the Gift of Life – her lung transplant – on Saturday, May 29th. Thank you for your support of our continued need to fundraise. Annie, I was saddened, when Nick, brought this to my attention, I so wish there, was something, I could do to help!! Other than donating a small amount! You and your family will be in my daily prayers! I have so often thought of you.So pleased, you were able to, have the transplant, You are a fighter; You got this!! Bless Your Heart!! Sending, Love, Prayers, and a Hug!